The story of Yuri!!! on ICE revolves around Yuri Katsuki, who carried all of Japan’s hopes on his shoulders to win at the Gran Prix Finale ice skating competition, but suffered a crushing defeat. He returns home to Kyushu and half feels like he wants to retire, and half feels like he wants to continue ice skating. With those mixed feelings swirling inside him, he confines himself inside his parents house. 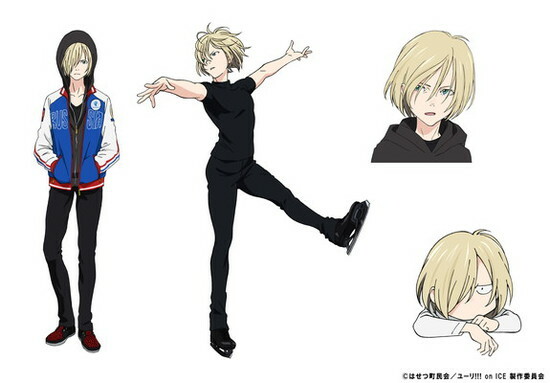 Suddenly the five-time consecutive world championship ice skater Viktor Nikiforov appears before him, and along with him is Yuri Plisetsky, a young Russian figure skater who is already defeating his seniors. Viktor and both Yuris take up the challenge on an unprecedented Gran Prix series. 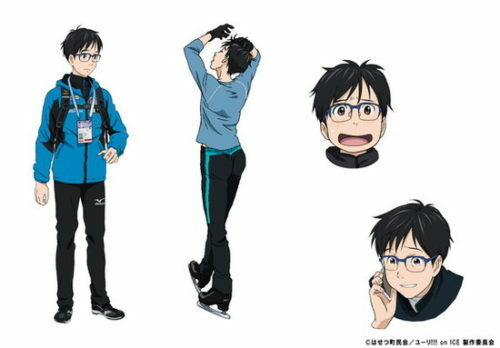 Yuri is a young figure skater considering retirement after he plummeted from world championship level to failing to qualify at nationals over the course of a single season. He goes home for the first time in five years in poor physical and emotional condition, reconnecting with his family and trying to reconnect with his love of skating – not realising everything is about to change. We often get sports anime at the start of an athlete’s career. Picking up with elementary school Yuri as he first discovers skates then comes to surpass his friends, or middle school Yuri struggling to balance training for regional competitions with studying for high school entrance exams, or high school Yuri working his way up to his first national championship – any of these would have made for a solid anime. Instead, we meet Yuri when he is 23, at a crossroads and in a state of doubt. To the people of his no-name hometown he is a proud success, but to other skating professionals he is a failure; he is aware of both opinions, and they are equally painful to him. To start an anime with this kind of everyday, relatable complexity is pretty rare, and it is handled expertly. The storytelling works by gently layering multiple elements, characters and settings to build up a world in which a story happens rather than spoon-feeding information to the audience. Throwaway comments in normal conversations hint at reasons why Yuri might have stayed away for five years, or what he sacrificed by leaving. There is occasional exposition given in voiceover or through SD imagery, but it is quick and lightly handled. As a general rule, the animation is used to convey both character details and set an atmosphere, supporting and elevating the storytelling, which is strong and sophisticated to begin with. The script sets up and subverts expectations, making a fairly slow-paced drama less predictable and even more satisfying to watch. Despite frequent use of cartoony facial expressions and visual gags, Yuri’s world is one of the most grounded of the season. His world is full of people who feel like people, not archetypes, with full lives which continue outside Yuri’s view. There are female characters of different ages, all with individual personalities, styles and mannerisms, none of whom are sexualised. This episode gives a lot of information on story, backstory and characters in this episode, but its focus is tight: Yuri is in a slump and needs to find a way out of it. To add stakes and complications, his idol, exceptional Russian skater Victor, has no idea who he is. His idol’s younger teammate told Yuri in no uncertain terms that he should retire, but Yuri knows that if he retires he will never get another chance to skate on the same ice as Victor. However, his performance has dropped so dramatically he may be forced into retirement anyway simply by failing to qualify for anything. Also, didn’t he love this once? What happened?